By Janessa	| Published on Monday, April 2, 2012. Did you ever see light stencils? Check out the fabulous enlightened souls by Fabrice Wittner. In 2011 Fabrice Wittner set out to commemorate the many victims of the magnitude 6.3 Canterbury earthquake. It hit New Zealand taking 181 lives and leaving a price tag of $30 billion. As the world and local communities reached out with aid, he was inspired to help in the only way he knew how, with art. While the focus was on rebuilding he wanted to remember those lost and the human spirit stirred by the damage. 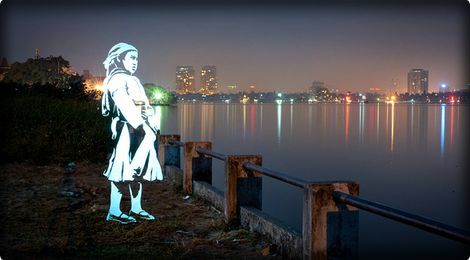 Using portraits he took on the streets to create life-sized stencils, he then “painted” them with light using long exposures to create images that are both haunting and beautiful. The “Enlightened Souls” project is ongoing as his challenge to perfect his method and quiet his reluctant critics continues. “Too photo-shopped looking” or “too still” are some of the critiques he’s hoping to quiet, but says “It turned out to be an interesting way to share ideas and feeling about society and life. After all, this is what street art is made for”. graffiti and technology. Adding light and life by night. Discovers 10 years of graffiti layers on parisian wall. How to paint automatically a train while it's rolling? Interview of Jasper Geenhuizen a gifted light graffiti artist from Netherlands. Astonishing pictures inside. Narcelio Grud is back. He invented a new amazing mechanical tool for the world of graffiti and spray paint. Did you ever paint a video? On a wall? Well now it's possible! Check out this wheatpaste video in Paris, Berlin, Belgrade. In this second part of Evan Roth's interview, we discuss his influences and ongoing projects. First part of an extensive interview Evan Roth granted us last autumn. In this piece, we go through how he came interested in graffiti and the genesis of Graffiti Research Lab.